Math Monday: Compass Art | Child's Play! I highly recommend you set aside some time to doodle. Specifically, to doodle with a compass, some watercolor paper, and as many colored pencils as possible. 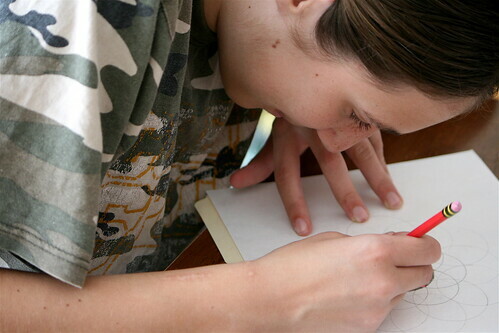 Get your kids involved, too–you’ll need someone to help guide you along on your doodling path, and kids are the best tutors for this kind of thing. 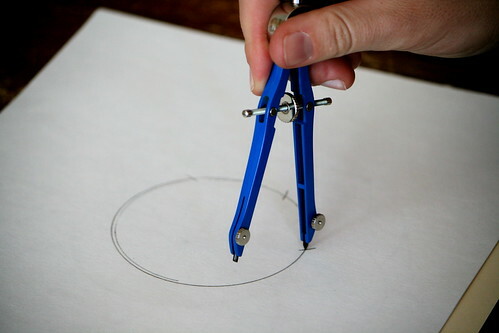 However, for this exercise, all you need is to learn how to draw circles with a compass. It’s not easy. It’s frustrating. It takes time and focus. It takes patience and forgiveness of your mistakes. But, to get all philosophical on you, that is precisely the point of the journey of doodling. Doodling is like life. You must be present, in the moment, and focused not on perfection but on improvement. These are big concepts for adults to learn, and yet through doodling even children can understand it. My kids have a writing ‘issue’ called dysgraphia. They would rather light themselves on fire than sit down with a pencil and a piece of paper to write down a thought or an idea. Doodling is something important we do because it puts them in a situation where they feel/are weak, but then transforms it into a strength. Most very visual thinkers have some kind of dysgraphia (or, aversion to writing), and yet they are wonderful doodlers. This is one of the few times I see them bent over paper, intent on writing with a pencil. Again, do not underestimate the power of the Doodle! Once you have drawing a circle with a compass worked out (and, Golfer isn’t quite there yet. 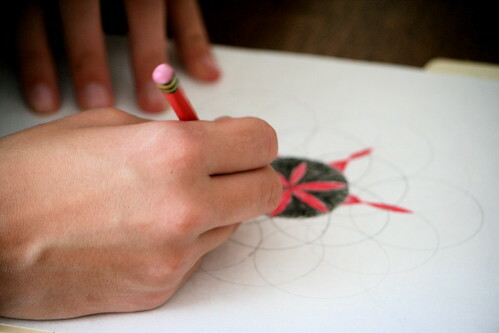 So, he practices a little and then I take over and he tells me where he wants me to draw his circles on the page.) 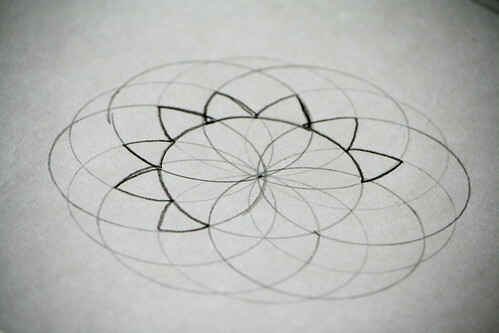 you can start drawing circle upon circle, noticing the patterns that appear. 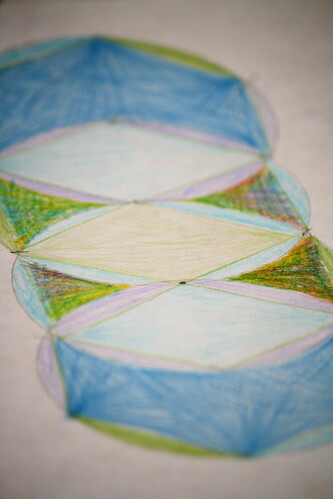 And then, you highlight the patterns that interest you, and color away with colored pencils. This is how the ancients discovered geometry. Drawing it in dirt, experimenting with shape. Seeing a square pop up in the middle of a series of circles. Finding other shapes by connecting different points in a circle. It is a fundamental level of geometry that is lacking in the current teaching of it. Take time to learn and doodle! My son’s dysgraphia keeps him from enjoying drawing art…people, animals, landscapes. 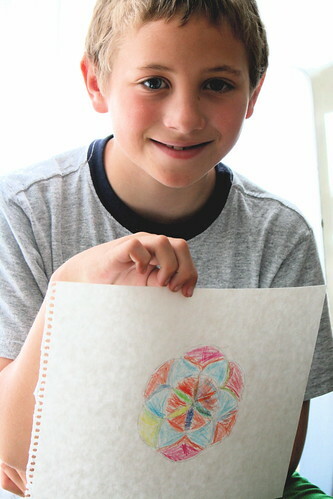 But when he creates circle art, he feels good about himself and what he’s made. Save the geometry ‘lesson’ and vocabulary for another day. Something profound is happening here! Investigation. 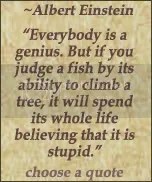 Thought. Connection. Magic Circles. And then something even more wonderful happens. You’ll be passing the fruit section in the grocery store and notice (or, even better, your kid will notice) that a pineapple perfectly mirrors one of your circle patterns. You’ll be gazing at a flower and see another one of your patterns inside. And then you’ll go back and doodle some more. As it should be. Doodling is too important not to encourage! other Circle Art patterns from some 5th graders. 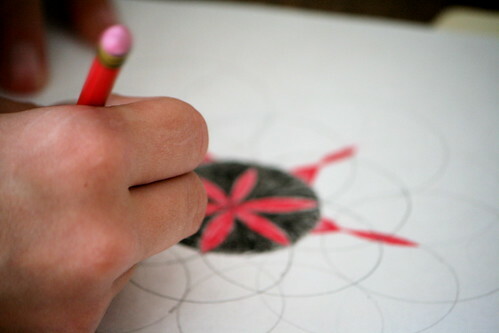 Before there was high school geometry (with it’s NCLB friendly scope and sequence), there was Sacred Geometry. The latter is so much more inviting than the former, and as easily understood by 8 year olds as it is by adults! I’m not sure how you know to post such spot on topics for me, but you do! Owen’s dysgraphia makes any kind of writing difficult and frustrating…. he will draw comics but last night told me he’s only doing single window comics from now on….. guess the writing/drawing was too much. This book is going on my list at Amazon. I’m curious about your thoughts on creative writing and the like for your kiddos….. because of the reluctance to do any handwriting are you encouraging typing??? I think I’d like to find an old typewriter for Owen to play around with. My kids did the same with comics. Now they do them on a comic book software, lol. I’m not really focused on creative writing. I’m more into creative expression. I love to write, but really only ‘got it’ sometime in high school. My kids would never get there if they had to feel so horribly about writing, that at this point I’m not fighting that battle. There’s some great beginning animation software that fulfills their need for creative expression, too, as well as the claymation stuff. They were way against typing until we got Spore, and now they type like fiends to talk to their friends on the Sporecasts, so it’s all good. I don’t make them write, but I do try to have them do stuff with their hands: dremelling, woodcarving, doodling, stringing beads, knitting, video gaming, etc. I’m thinking Owen is doing stuff outside with his hands pretty often, yes?! I found your blog by way of the Living Math Forum. I’m new to living math and a bit confused. But I KNOW this is the best way for my 11 yo son. I loved this post. I’ll be back to find more activities for us to do! thank you for blogging about math…you really have helped this homeschool mom ALOT! 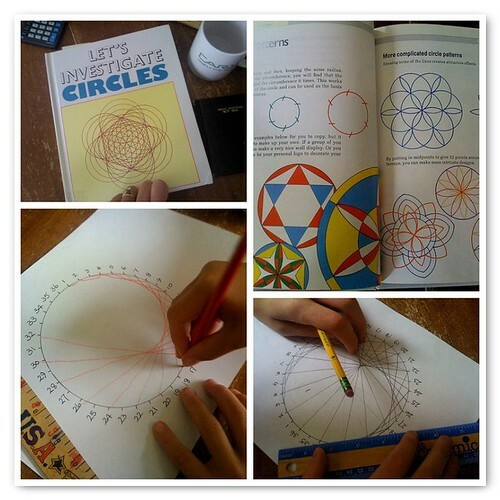 I always loved making circle art in math and wished we’d do more of it. 🙂 What a fun book. I can’t seem to fully load this site from my smartphone! !